But from time to time I have not had my camera at a moment when I really wished I did. For example, John and I were walking to the Cuban coffee queen a couple of weeks ago. Chickens are ubiquitous in Key West. There’s even an ordinance that protects them from harm. And tourists go mad over them, so I don’t that often pay them much attention, although I do comment on especially handsome roosters. (The video above is not the one I missed, not quite as spectacular, but cute..) But on that morning I saw a very wide hen spread out on the sidewalk. So wide, it was like a chicken pancake. “I wonder if something’s wrong her?” I asked John. And as we watched for a moment, she stood up, and out from under her wide spread feathers rushed 10 tiny chicks. I so wished I had had my camera set on video for that moment. It would have gone viral! Reds, how do you feel about the constant stream of photos we're bombarded with? Are you a photographer? Tell us about one of your favorites. HALLIE EPHRON: I wish you'd had a camera too for that hen. I love all the pictures and videos and how easy it is to take and share. Our kids are constantly sending them of the grandkids. It's almost like being there. Here's a video they sent us of our adorable grandson... there's nothing to it but my oh my it makes me smile. JENN McKINLAY: Pics or it didn't happen! Just kidding. Honestly, I love the constant stream of images. My family is all on the east coast and yet I still feel close because we share pictures, videos, and texts all the time. When the Hooligans take flight from the nest, I know it will be hard but staying connected through pictures will make it much more bearable. RHYS BOWEN: I have just come home from an all day photo shoot. Six hours of sitting in front of a camera. My face is really tired of smiling so I may be a little anti-photo at this minute. But I do agree that sometimes we spend so much time taking pix that we lose the moment. I loved taking pictures of the grandkids when they were small. I take zillions every holiday with the family and I do enjoy looking at those. But sometimes when we travel now I leave it to John to take the pictures. INGRID THOFT: I love that we have the means to capture our lives on film, but I agree with Lucy that it can take away from the experience if you’re too focused on the documenting rather than the living! That said, nothing makes me smile more than getting a text showing my niece in her Halloween costume or my nephew in his bow tie before his band concert. 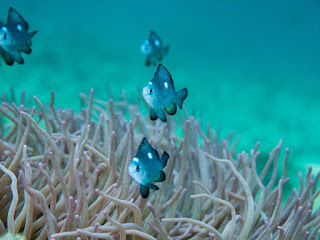 In addition to family pictures, my favorites are the photos and video my husband takes underwater. 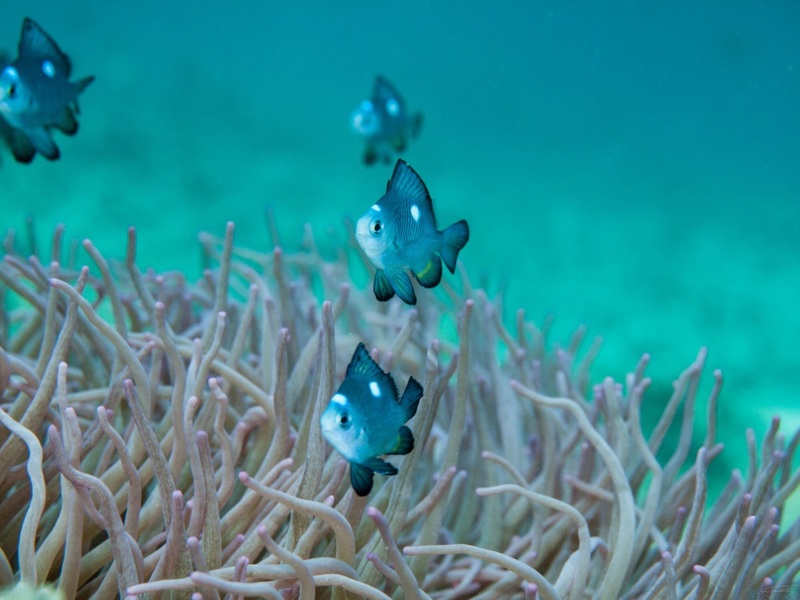 The slide shows of our snorkeling and scuba diving excursions are a huge hit in our extended family, and it makes me so happy to look at the pictures on our walls and see reminders of far flung locations like Fiji and the Great Barrier Reef. 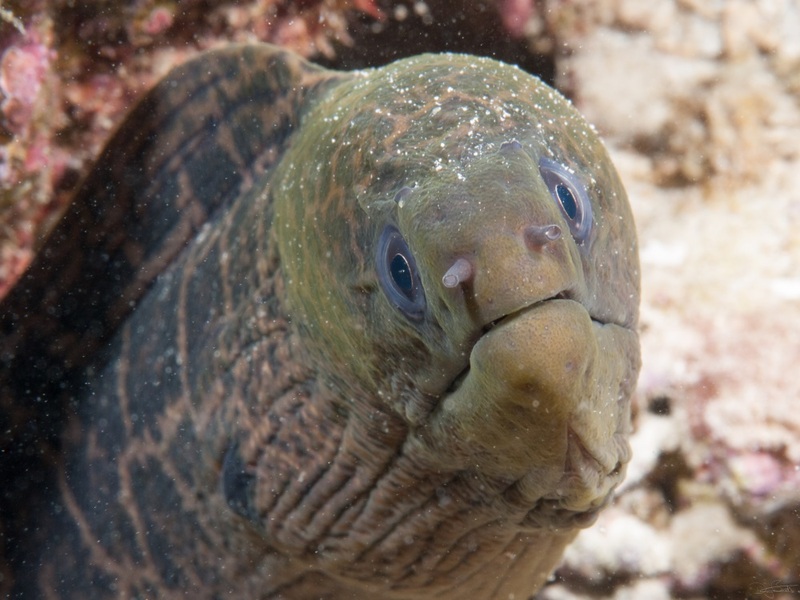 The creatures aren’t all as cute as the nieces and nephews, but we have a soft spot for them! 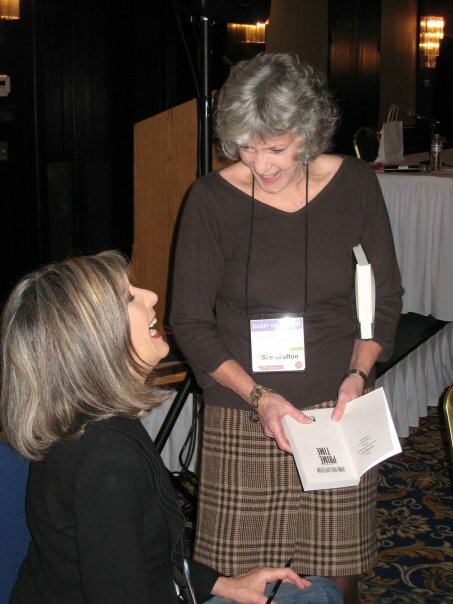 HANK PHILLIPPI RYAN: Well, I love them. I know it's distracting, and yes, there's the constant thought that we aren't living in the present, or seeing things--but just taking a photo of it. Where was I recently, some event, and all you could see were peoples' camera/phones. They had the lens between them and reality. And the Selfie Kid at the Super Bowl--there's Justin Timberlake, dancing right next to him in the stands--and all he can think about his getting a photo. I fear I might have done the same thing. But I adore family photos, cannot get enough of them, and it doesn't have to be my own family. 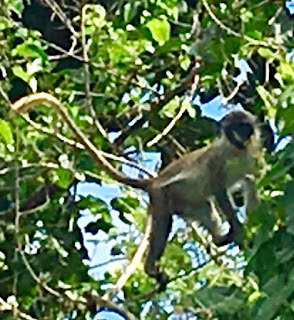 When we were on vacation last week, there were wild monkeys in the back yard of the house we rented, and I took about a zillion photos of them. 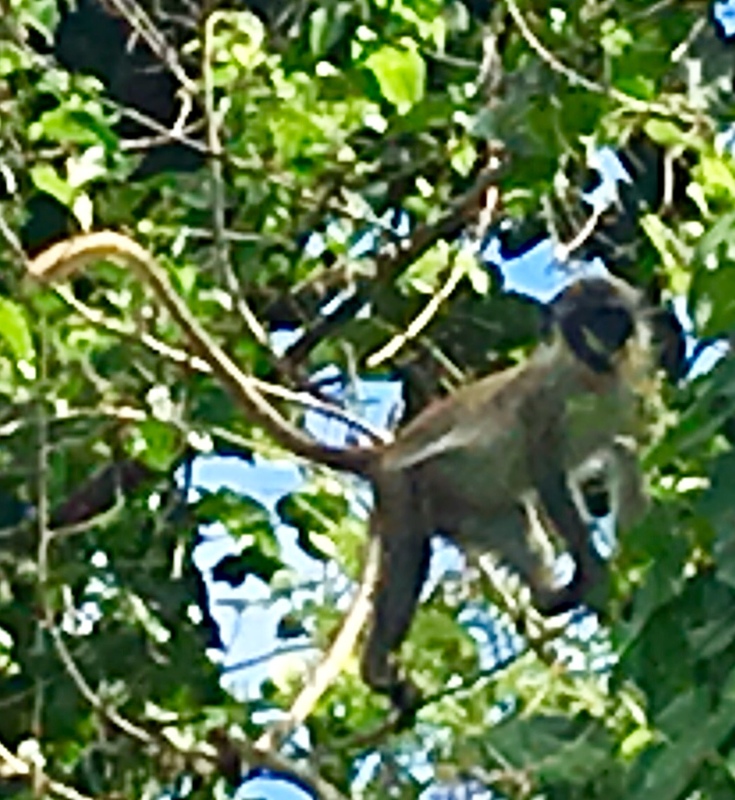 (Here's one in a tree.) . And wow, when someone captures a once in a lifetime moment? Like--here's Sue Grafton asking me to sign my book to her! I mean--thank goodness for someone who had a camera at the ready! I am aware that I'm not always a "good" photographer--my pics are more like happy snaps. But I try. JULIA SPENCER-FLEMING: I am ever more not a photographer. Back in college I spent the summer in Italy, and took five pictures. Five. My sister Barb, on the other hand, takes pictures of everything! She's put together some wonderful small photo books of her and the boys' visits to Maine, and given them to me. I love them. Now that everyone has a camera in their pocket, I have upped my quotient. I think I took ten pictures on our recent vacation in Hawaii! I focus (no pun intended) on images of family or friends, in part because I have a very good memory for places and sights. I don't have any photos of Victoria Falls from my 1998 safari, but I have a complete memory of sitting on a rock and watching the water roar by - the sound and the damp and the lightness of the sky. On the other hand, I find it hard to conjure up what the Smithie looked like as a toddler. I need a camera for that! 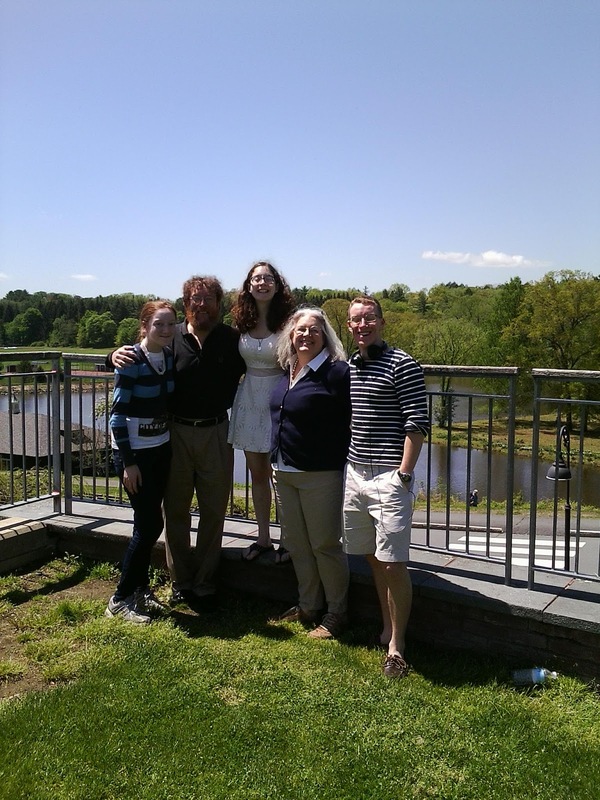 Here's one I particularly love - the family in front of Paradise Pond, on the Smith campus. It's Ivy Day, the day before graduation, and all the girls wear white. It's a nice picture of the five of us, and it also takes me back to that event, and how happy and proud I was. DEBORAH CROMBIE: I worry a lot about documenting when I should be appreciating, especially when I am traveling. It's hard to strike a balance. But there are moments when I am so glad I just happened to have my phone handy, when I would never have had a "real" camera at the ready. 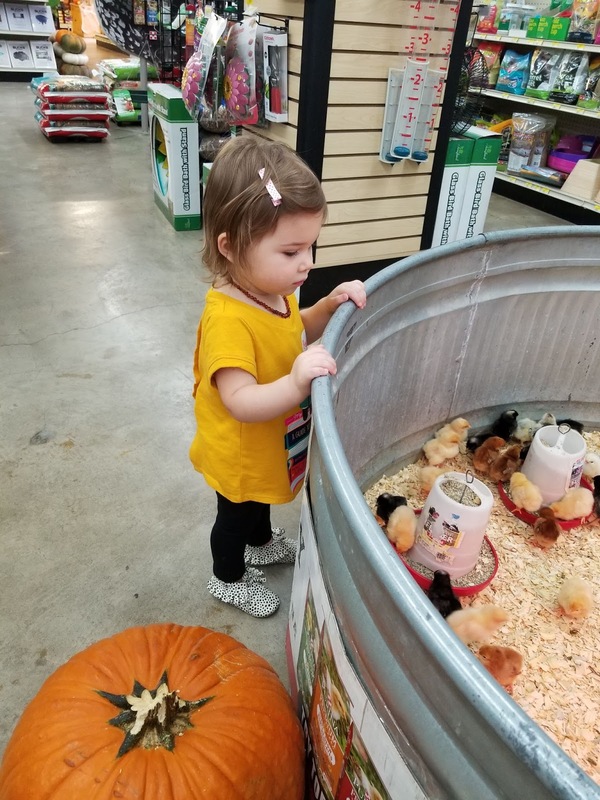 Here's one from last fall, of my granddaughter discovering the chicks on a trip with me to the local feed store. 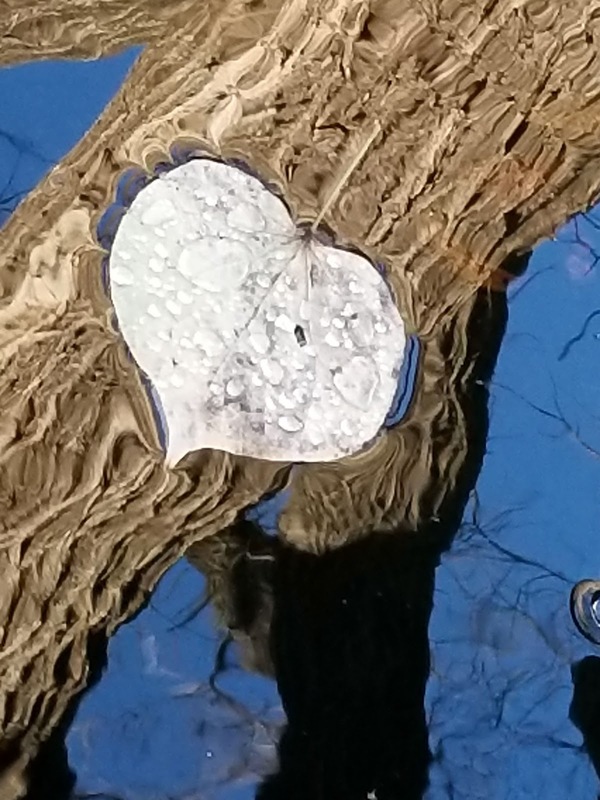 And here's another, of a red bud leaf floating on our pond, that I would never have captured if I hadn't had my phone in my pocket. Red readers, are you fans of the instant photos and videos we see all around us? Or do you see a dark side? Or both? Pictures are such a wonderful way to be able to save a treasured moment or look back on a special day. I like seeing the pictures, especially when the grandbabies are in them, but I am not so good at taking them. Thank goodness John manages the camera so much better than I. My daughter is the “post everything” queen of the world, which is nice in that I get to see all those lovely pictures of all of them. Me? I don’t post pictures . . . . I love taking pictures, and I have a nice digital SLR camera, but I must also warn against hiding behind that camera at big events. I attended Norwood family gatherings for more than 20 years, and took scads of photos at every one. When I look back at them now, I'm not in any myself. Kind of a metaphor for how I fit into the Norwood family, but still, I wish I'd put the camera down more often, or handed it off to someone else once in a while. Having learned that lesson, these days I have to remind myself to take pictures. I'm not big on selfies, but I do wish I'd think to get a shot of myself with some of the outstanding musicians and composers I meet, and a few more with my lovely colleagues. As with everything else in life, I think we need to find a balance. Watching the hen spread out over her chicks, remembering it, and telling the story is a lot better than seeing the hen and missing the chicks while you dig for your camera, get it booted and focused and missing the shot all together. Gigi, that is so true. I married into a family of professional photographers, and at the time there were precious few family photos. While I am not in any way a pro, I have learned a few things over the years about taking a pleasing photo, especially of people. My motherinmothe hated having her picture taken, but she learned to trust that I would not take a photo that didn't flatter her. Consequently, my photos of her are some of the very few we have. But I noticed the same thing while going through family pictures, at one point. Very few of me. That was supposed to be my mother-in-law. We got it Karen! The good thing about having a digital camera or iphone is you can take lots of pix and then delete, delete, delete. Back in the day I took photos all the time, and sold them. One in particular still surfaces occasionally as a post card. It was a sunrise in Jamaica, but I've seen it titled as a sunrise in fill in the blank. Funny how that happens when you sell the rights! These days, hubs is the iphotographer. He's always got the camera at the ready while I'm thinking, sure wish I had a camera for this and mentally setting speed and aperture! 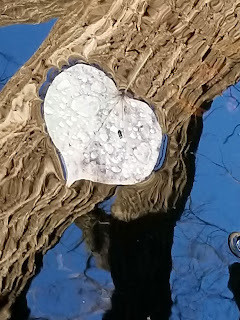 We take a lot more pictures these days, but they're so much more ephemeral in nature, aren't they? I'm not sure which is better, the old photo albums, or thirty million snapshots in a cloud someplace. Something seems missing. I just bought my sister in law a digital picture frame. You mount it on the wall and load up 10,000 pictures and it just streams through them. She's testing it out for me. Having the means to photograph something at your fingertips is fine. The problem with it is that people waste time by taking things that really don't need to be documented. I mean, do you really care about what other people are about to eat, with the sometimes follow up pick of the remains of what they just ate? It is much like anything else in life, some good some bad. 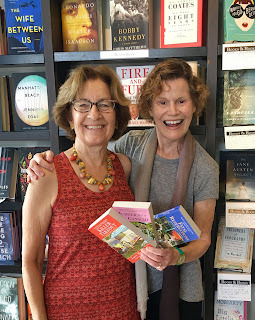 I like being able to take a photo when I meet an author (ask Hank and Ingrid) or a musician. But random slice of life stuff bores the everlovin' crap out of me when it is clearly something that doesn't need to be documented much less shared with the world. You're funny Jay:). I love seeing pictures of food! I've taken three pics of food that I can recall. One was of the plate of food that represented my first time cooking the Thanksgiving meal. The second was the first time I used my mom's recipe for homemade applesauce. The other one was the one and only time I did any baking. A friend of mine mentioned that no one made her a cake for her birthday. So as a semi-joke since she lives in New York, I was led through the process (though I did the work) by my mom of baking a cake. So the picture was of the cake with a slice cut out on a separate plate saying that I had her cake waiting for her. Notice the theme? It was all first time experiences. The food photos I hate are those that are "I went to McDonalds for the 5,762 time in my life and here's yet another photo of the half-cooked burger that they always give me." Way back when my now-29 year old son was in kindergarten, I worried about taking a video of the little play he was in rather than just watching him perform - and that was with a real video camera. But with the aging brain, I loved that pictures anchor my memories. The photos of me in a lime green jumpsuit that my mother has of me from a gymnastics recital when I was about 8 are horrifying enough. If there was video of it, I'd crawl into the deepest darkest hole I could find. Lime green and pasty white skin DO NOT GO TOGETHER!!! This is reminding me of the 'slide shows' we used to inflict on our friends after returning from a trip. 350 pictures in 20 minutes, my husband running the slide projector and me yelling CLICK! Now it's drip drip drip one at a time and each one gets its due. Better. I think. Great post, Rhys and everyone, on the pros and cons of constant recording. This is a quote from John Fowles's DANIEL MARTIN (1977) that profoundly affected me when I was 22 and has made me stand and burn things into my brain, rather than shoot and go. It's amazing how prescient he was: "...he had forgotten the extent to which every man is now his own image-maker. It was almost frightening, this obsession with capturing through one sense alone, and one that required so little thought or concentration: a mindless clicking. It encouraged the clicker not to think; not to imagine; not to remember; above all, not to feel.... merely to duplicate seeing, to advertise in some future that one had been there." Yes, please do something with your slides before they deteriorate beyond use. My father had taken thousands of slides - of trips and people and everything else - which my mother saved and then my sister put on discs for all of the family. But some of the slides had gone so bad they had to be discarded. And then in others we had absolutely no idea who some of the people were. That was pretty sad. Sometimes we couldn't even figure out where they were! I watched my youngest nephew's senior lead in 'Oklahoma' through the lens of a videocamera. Not the same as being immersed in the performance--but afterwards, I was able to take the video to shut-in aunts and uncles and share with them--and to watch it myself over and over. And sometimes when I'm walking and focused in the moment, there are images that seem to leap out at me from nature--sunlight pouring through leafless sycamores--the sky behind a vivid blue; water running over smooth rocks, curving away from the bridge into woods; a trailhead--moss and leaf litter underfoot--leading away to some unknown, secret destination. In those moments, focusing--really focusing--on the image heightens my awareness. In fact, there's a book on the subject of mindfulness and art (including photography). Not saying my photos are art--and I take plenty of fun ones, of boys and cats and pups--some of which I post to share with farflung friends and family. As Jay said, the camera brings good and bad. what a gift to be able to take the video to the other relatives. By the way, if you go to a concert of any kind these days, half the schmucks in the crowd are watching the show through the phone as they stream the darn thing on Facebook Live and keep obstructing my view of the proceedings. One overcast Sunday morning in New Orleans, I wandered down Canal Street to the Blue Dot, the local donut place. Percy the local pig had dropped by for his powdered sugar donut hole and I snapped a cellphone photo of his sugar-coated snout. I use a camera when I travel, but my cellphone is great for impromptu shots. Love that image of the sugary snout! I'm currently running an Organizing Challenge with people where we're organizing printed and digital photos. The darker side to taking all the pictures is what do we do with all of them and do we need to keep all of them? My clients in my challenge group have found the process eye opening... from the days we used to say "but there are 24 shots on this role of film and I have to make everyone count" to the "let me take 24 pictures of this one sunset because it is so pretty, what we view as important TODAY is so different from the moment we hit the shutter button (analog or digital). I was always a "behind the camera" person. But then I found that I was just focusing on the service of capturing other people's memories, not my own. I mean, do I really need 100 photos from a cousin's wedding 20 years ago that ended in divorce 5 years later? I even love to watch people’s vacation Slides! I know that is thought to be the most painfully boring experience one can have, but I fully embrace it!! I love it, too, Hank. It's the only way that I'll ever get to see most places! Seeing pictures taken by people I know brings places alive for me. Used to be I'd have piles of film to develop, because I didn't have the money to get them all. Then if I did, I'd have 20 pictures of my thumb, and almost no pictures of me (because I was the one taking them all). We have boxes of photos that we are going to put in albums "some day," but "some day" hasn't arrived yet. Now, I have a computer/phone/cloud full of digital images I'm going to print and put in albums "some day," but...some day isn't here yet. I like seeing photos online. I like people sharing their lives, especially since a lot of my friends and family are distant. But I agree that there is a time for leaving the camera behind and just enjoying the moment. Blogger doesn't like me! I wanted to add my photo shoot Pix. I love the iPhone camera, and yes, I know people get better pictures with a SLR, but I can't carry one of those around my neck all day. The advantage of digital is that you take 24 pictures of that sunset and then nuke 23 of them, saving the best of the best. I'm sure, as a resident of Rochester, which was practically built by George Eastman, that there are distinct advantages to film. There were advantages to cave paintings too, but how many of us are still doing that? When we were in Tanzania, my husband and another photographer were constantly taking photos. After all, it was the whole point of the trip, for them. We were driving back to our tent camp in the Serengeti one evening, kind of in a hurry, because no one is allowed to be out and about there at night, and darkness falls at just about six, because of the equator's nearness. However, our driver spotted two lions stalking some zebra, just over a bit of a rise near a watering hole, and he stopped so we could see true-life drama. He pointed it out to us, and we all tried to find the animals--the two men with their cameras, me with my binoculars. Which is why I was the only one who saw the moment when the lions took down their prey, just before they all fell over the little rise and out of sight. If I'd been trying to take pictures I'd have missed a once in a lifetime slice of nature, as they did. I'll never forget it. I hope they at least got pictures Karen! Nope. My husband missed the moment, and the other guy could never see where to look, so he missed it, too. If you're wondering what to do with all those digital photos that are just "out there", you can buy a little photo printer. I have a Canon Selphy. It's so small that I've even taken it to England with me so that I could print pics for my travel journal, and the photo quality is amazing!! Of course I only print the photos I really like, so you don't end up with dozens of prints of your thumb, lol. and then what do you do with them Debs? We have lots of family slides that should be preserved. I remember we'd have slide shows in the living room when I was growing up that usually featured exotic trips my dad took for work. The pictures of places like India were spectacular. Jonathan has a million slides, too. I'd love to see them, whatever they are, but first...we need a projector. And, oh, a screen. SUCH fun to watch slides! It's almost..suspenseful. I don't know about slides, but I know there are a ton of photo albums in the den that really only get looked at when there is a need to do a photo collage for the death of a loved one. I have boxes and boxes of my parents slides, which are probably all ruined because the only place we have to store them is in the attic. But no projector or screen, alas. I think you can take them to be digitally transferred, though. I remember slide shows as a kid. My dad had most of them made into photos. I took all of my film videos and had them digitized at iMemories.com (not prohibitively expensive). I'm actually not that good about taking pictures. I often just take one or two a month. Maybe I need to change my view of what moments need to be captured. Or maybe you are staying in the moment and doing just exactly what you should be doing! I have taken over 8,000 pictures in two years - I think I need to calm down. LOL. Love photos, videos, and Face Time -- I have to keep track of six grandkids, people!! But these days I am also inundated with black and white photos that cover more than a hundred years of my Dad's family -- and sooooo few are labeled!! There is one album where the person cut the photos and made collages on each page -- including Suffrage Parades -- now what do I do with them?? wow Denise, that's a very good question. any suggestions out there?? I’ve attempted to label old pics with names and places but it’s a huge job. However if I don’t do it, no one will. Denise, I don't know if you'll see this now, since it's a day late, but your old photos of historic events might be of interest to your local historic society. My husband has always been big on taking photos. For many years, at family gatherings, siblings, nieces and nephews were always scolding him for taking so many pics. But it's been interesting in the past few years how several of them have told him that they not only no longer resent it, but they are really grateful for all the wonderful family shots he is responsible for. So that's been a cool evolution. I'm less quick to grab a pic, even with the relative ease of my camera. In fact one thing that drove me to do it more was when it became quite clear that the algorithms of Facebook really are pretty much set at "It only happened if there's a pic." I got tired of getting no responses to my post about something I was doing when hubby was getting a hundred -- because his photo was showing up in everyone's feed and mine wasn't. Sounds a little unhealthily competitive when I read what I just said, but hey, it's the truth. I have actually started to cut back on the number of pictures I take to try and enjoy the moment I'm in instead of worrying about getting a good picture. Having said that, I know I still take too many, especially of the granddaughters. And, speaking of the granddaughters, I know that one of my favorite pictures will always be the one I took of the eight-year-old (think she was seven in the pic) on top of a jungle gym in the park where she is reading a book. It's easy to want to take picture after picture of the outdoor splendors, trying to make sure I get just the right shot, but I'm working towards less shots on that, too. One of my favorite nature shots, and a time I was certainly glad to have my iPhone camera, was of a mother opossum and he babies clinging to her back and sides. That was taken just across the street from where I live, giving credence to the belief that there are wonders all around us. Another favorite nature shot is on the island of Molokai looking out to the sea and cliffs around the spot where we stopped for lunch. Like some of the others of you here, at some point I noticed that I wasn't in most of the family pictures, as I was the one taking them. So, I try to do better about that, although I am not good at all about doing a selfie of a group I'm in, with my arm stretched out to include everyone. I do think these young whippersnappers these days are far more savvy with the camera than I am. Oh, and my daughter is great at making albums out of her family's vacation photos. She uses Shutterfly and has albums made for each trip that way.